Something close to the unbelievable has happened... maybe all of our efforts and patience has paid off!? So my friend Paul Miller told me that the latest GT-R Magazine (Vol 121, March 2015) was now on sale, with a BCNR33 on the cover. Following what appears to be the general trend (or perhaps they are responsible for it?) the magazine's recent focus up until now was the R32 and R34, and then when the R35 was released, a few successive issues on the R35, so naturally I haven't been a big reader lately. (Although, I will admit the magazine started in 1994 and thus covered the 32 and 33 in depth back then.) Plus, all the products they feature for the cars all have the GT-R tax so that annoys me as well. 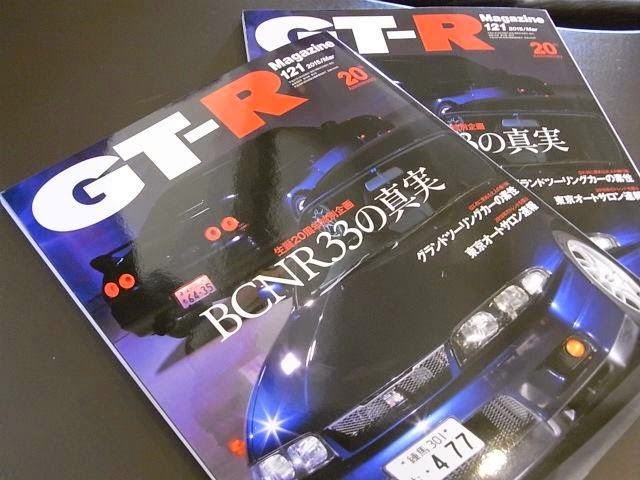 Needless to say, I was surprised that GT-R Magazine featured the R33 GT-R so prominently...and the title... "The Truth about the BCNR33: 20 Year Anniversary Special Project." This issue features several stories on the development of the R33 GT-R, for example the goals of the engineering and design teams. 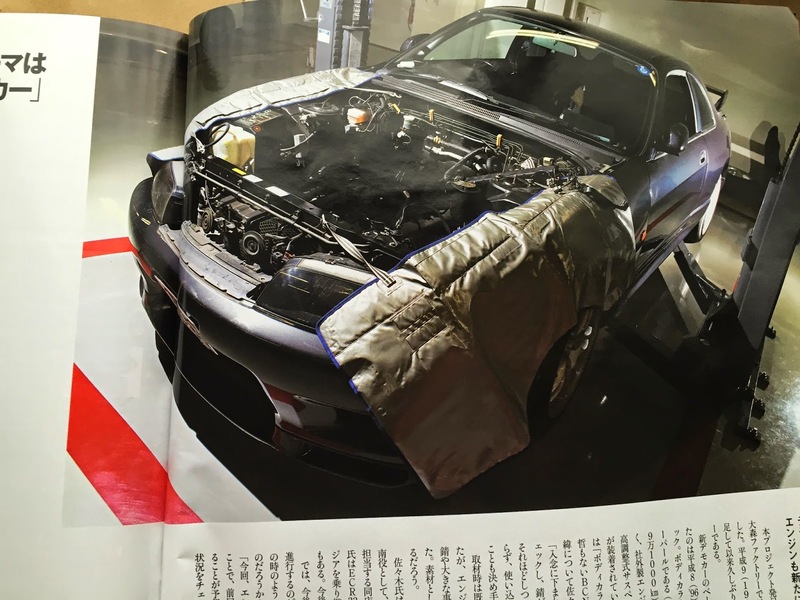 I plan to scan in (and maybe translate or at least summarize) those pages later, but many of the photos are the same as can be found in the "I Love R33 GT-R" Mook from which I also sourced my research on how the R33 GT-R improved upon the R32 GT-R. 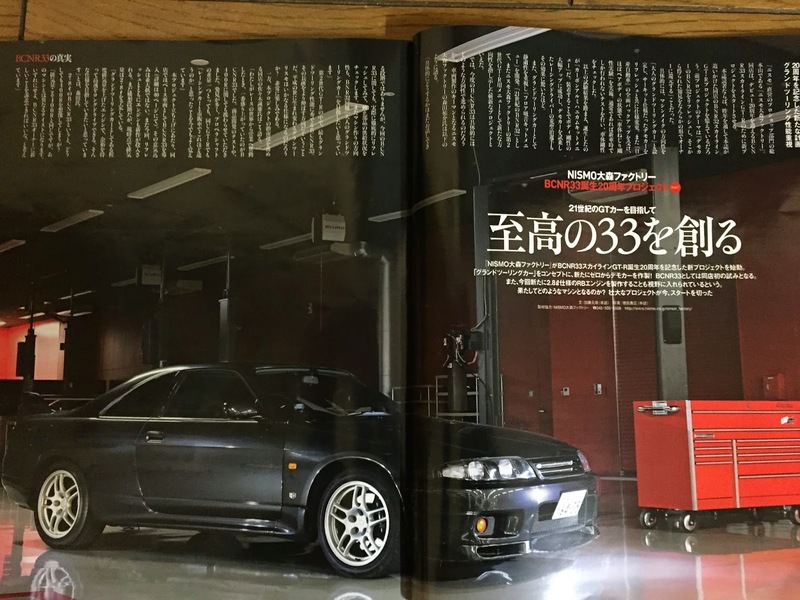 There are also some interviews from notable figures such as Niikura-san at Mine's, Mukai-san at HKS Kansai on what they think of the R33 GT-R, an editorial from racing driver (and test driver for the 400R) Takayuki Kinoshita, and reflections by R33/R34 chief product engineer Kozo Watanabe. Also a spot light on current Nismo driver, Tsugio Matsuda who owns a red R33 GT-R, silver 400R, and just recently bought a white 260RS. 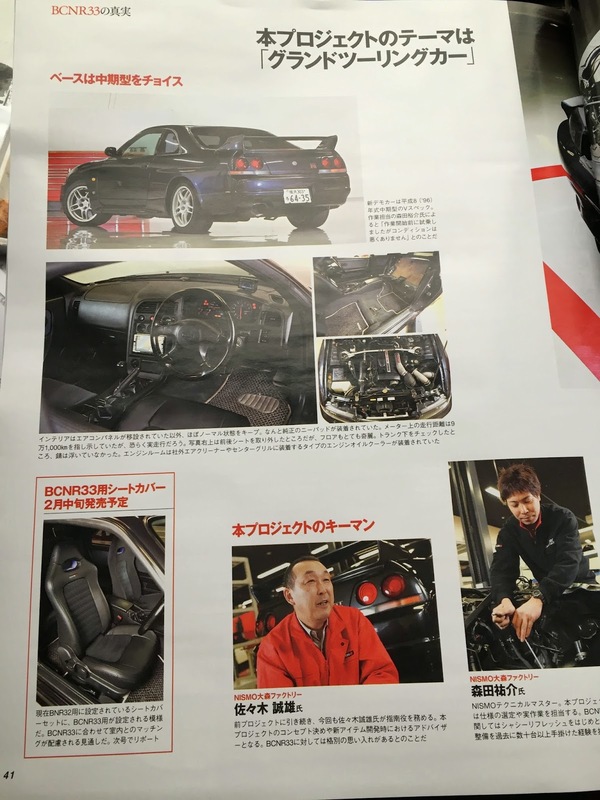 Nismo Omori Factory has, in celebrating 20 years from the birth of the BCNR33 Skyline GT-R, begun work on a new project. With the concept of a "Grand Touring Car," they will make a demo car from the ground up. This will be the first time ever Omori Factory tries this on a BCNR33. Also, it is rumored that it is possible a new 2.8L spec RB engine will be created. What kind of machine will this be? A magnificent project is now, beginning. A new plan to celebrate its 20th anniversary; emphasis on "grand touring"
Nismo Omori Factory - the "head temple" of Nismo's direct sales pro-shops. Omori Factory has now embarked on a new project for the BCNR33 Skyline GT-R, which has seen 20 years from its release. Readers of this magazine should remember the BNR32 Skyline GT-R project we followed all last year. The theme of that project was, "by refreshing [Japan speak for rebuilding] the BNR32 demo car, to return the knowledge gained in some form to owners." Specifically, the plan for the machine was "a grand touring car for adults" and so the demo car's track focused spec, was changed along with its rebuilding. Also, with Nissan Motor Company's complete support, they were able to conduct "chassis torsion rigidity tests" on the almost completely stripped down chassis. By conducting a test that is normally done when the car is new, they were able to check the body rigidity. What resulted from the above test was the "carbon aluminum honeycomb kit menu." By installing this they were successful in greatly improving the body rigidity, and racing driver Seiji Ara who test drove the car was shocked at the result. Also, as a grand touring car emphasis was placed on quietness, which lead to the development of the "floor sound dampening kit menu." So this project can be said to have resulted in a "21st century BNR32" giving rise to a new direction for Nismo Omori Factory's second generation GT-R menus [Japan speak for a series of optional parts]. "We are not at the stage yet where we can talk about what we do in particular, but with respect to this BCNR33 as well, we will be completely rebuilding it, and checking on the supply of OEM parts. Also with regards to the machine itself, we would like to aim for "adult grand touring car" like we did with the BNR32." The BCNR33 has, amongst the second generation GT-Rs, superlative grand touring abilities. So this advantage will be improved upon. What kind of spec will a reborn "Heisei-era" grand tourismo be? We eagerly look forward to this. "When I transferred from the racing world to the business world, the BCNR33 was the most exciting. I was allowed to participate in parts development and testing as well as the 400R. There were so many new discoveries. I still remember thinking "the huge difference between a racing car and a production car" for example on the weight of the drive shaft." For this project, Omori Factory purchased a BCNR33 as the base (see details below). The enthusiasm for this was more than the usual. Also this time, in addition to the rebuild they will be investing in a new engine. While still at the planning stage, at present time it is anticipated to have a capacity of 2.8L. "As a grand touring car, we should at least have an engine with increased capacity, one that can go on long drives at high speed with ease. We would like to aim for that kind of spec" says Morita. When one thinks of a 2.8L BCNR33, we always envision the 400R, though? "While the capacity would be the same as the 400R, this will have a different flavor from that machine. In any case, we would love to promote a new item to BCNR33 owners." Purchased a 33 as the base for the demo car. Begin development on a new engine! To inaugurate this project, Nismo Omori Factory purchased a BCNR33. This is the first BCNR33 demo car for Omori Factory since they opened in 1997. The car chosen as a base for the demo car is a 1996 (chuki, Series 2) V-spec. Color is the rare dark grey pearl (and the car's odometer shows 91,000 kms). This is not a stock car, as it has an aftermarket engine oil cooler, coilover suspension and mufflers, etc. On the day of the photoshoot, our first impression was "other than the body color, at first glance an ordinary BCNR33." Sasaki-san describes the story behind its purchase. "We elaborately checked the condition of the under chassis, confirming there was no rust. It wasn't excessively tuned, and didn't look worn out; these criteria were also deciding factors." The day of the photoshoot the engine had already been removed, and looking into the engine bay, we did not see any rust or evidence of a large accident. As a foundation, this specimen is fantastic. Sasaki-san, as the coach for the previous similar project, supported Morita-san who decided on the specifications and the actual construction. Morita-san is actually a mechanic who knows how to "drive" having owned an ECR33 Skyline and then an M35 Stagea. We can expect great things from his future activities. "This time, we will work on the engine too, and so the work is anticipated to take longer than last time. While checking the availability of OEM parts, we are thinking about how to mix items we have already developed, with items that will have to be newly developed. We imagine a schedule where we are not rushed, and can take breaks and look back." According to Morita-san, expected completion date would be fall of next year [this was at the time of the photo shoot so I think this means 2015? I will find out from Nismo...lol]. Of course, during this time not all work will be focused on the BCNR33, new items for the BNR32 and BNR34 will continue to be developed in parallel. The (Nismo Omori Factory demo) BNR32 that we covered up until the last issue, still has to get its suspension sorted out. "The BCNR33 has superior high speed capabilities, and is superior in space utility to the BNR32 and BNR34. It is a GT-R with extremely magnificent potential. As Nismo Omori Factory, we are aiming to create a package that can be properly called a Grand Touring Car. In any case we will not likely have another large scale project like this for a while. Please look forward to the result." Finally - the BCNR33 Skyline GT-R 20th anniversary project has begun. Will the new engine's name be the "RB-X GT3" in homage to the 400R? Will the exterior be kept standard, or will it be outfitted with Nismo aero parts? Will there be new parts developed, like the "Carbon Aluminum Honeycomb Kit Menu"? As GT-R Magazine we are all consumed with interest. We plan on reporting, in parallel, the body rebuild along with the new engine development. Don't miss it! The Theme of this Project is "Grand Touring Car"
First photo caption: The new demo car is a 1996, chu-ki (Series 2) V-Spec. Mr. Yusuke Morita, in charge of the project, said "before beginning work we test drove it and the condition was not bad." Under the three photos: The interior, other than the HVAC controls having been moved, is mostly stock. Amazingly, it has the optional knee pads. The odometer shows 91,000 kms, this appears to be actual. The above right photo shows the seat removed, but the floor is also very clean. Below the trunk, there was no rust apparent. The engine bay showed aftermarket air cleaners and an engine oil cooler that fits behind the center grill. (left) Nismo Omori Factory: Mr. Masao Sasaki. Following the previous project, Sasaki-san again assumes the role of "coach" this time. He will be the advisor for determining this project's concepts and the development of new products. He has special memories with regards to the BCNR33. (right) Nismo Omori Factory: Mr. Yusuke Morita. He is a Nismo Technical Master. For this project, he will be in charge of deciding the specifications and doing the actual work. He has experience in heavy maintenance, including chassis rebuilding, on dozens of BCNR33s. Bottom left, thin red frame: Seat Covers for the BCNR33, expected sale date in mid February. In addition to the seat covers now available for the BNR32, plans are to offer this for the BCNR33 as well. These will be designed to match the interior of the BCNR33. Details in the next issue. Wow, this is certainly an exciting development for all owners of the R33. I am looking forward to seeing what comes out of Nismo with this. The promise of new parts is always exciting. Thanks for taking the time to share this with us Aki. Curious to see which parts will come. Thanks for the update. Please let us know if the seat covers are retrim or just goes over existing seat. Eager to what comes out of this at the end. After a long time I can finally read your awesome blog again without a bitter feeling. Aki, your work on researching the development concepts for the R33 is tireless and appreciated. I adore the R33 most amongst a number of generations of wonderful machines, so this information is music to my ears. Thanks for the translation. Fantastic work.